As everyone is reacting to Leonardo’s battered body being thrown through April’s apartment window, a cadre of Foot Soldiers crash through the remaining apertures in hot pursuit of the fallen Turtle. A fierce battle takes place and April’s home is trashed. The wonderful Holiday spirit that had pervaded the apartment mere moments before has been shattered as easily as the panes of glass. The Turtles retreat to the first floor of April’s building, fighting Foot all the way. Leonardo is badly hurt and can barely move, so April helps him walk. O’Neil is nearly killed as she opens a door, but she’s saved by Leo’s quick reactions. The exertion causes him to collapse again, but our heroes make their way to April’s ground floor junk shop (which she inherited from her father). Unfortunately they find the Shredder and numerous Foot Soldiers waiting for them! 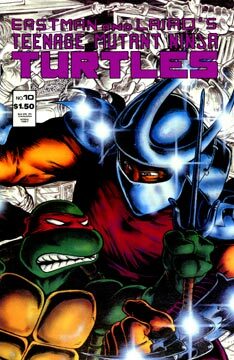 As things begin to look hopeful for the TMNT and crew, the Foot blast a hole in the ceiling of the shop and more enemies drop into the melee. April remembers that her father had done a poor job of sealing an opening in a defunct walk-in freezer (the shop had once been a grocery store), so everyone heads there to escape. The blast in the ceiling has created a fire, and the smoke alerts the local police. As the sirens wail and the building burns, the Shredder and his Foot make their escape. Casey, the Turtles, April and Splinter manage to get out of the burning building by way of the freezer. They decide that they can’t take the van due to the police presence and head out on foot (no pun intended). From a rooftop several blocks away, our heroes watch April’s building burn. April falls to the ground and cries.